We advise on portfolios across a range of different investment styles. In each case we believe our role is not to avoid risk, but rather to understand the relationship between risk and reward and to manage risk appropriately, relative to the objectives of the portfolio. We select investments and construct our portfolios in a disciplined manner, with an emphasis on identifying and controlling risk. We avoid speculation and our Investment Process ensures our portfolios are appropriately diversified. The investment process involves understanding the specific objectives and risk aversions of each individual client. A tailored portfolio of funds is then constructed to meet that clients objectives and is then managed on an ongoing basis. The overall investment and fund selection process is a top down approach using tactical asset allocation. 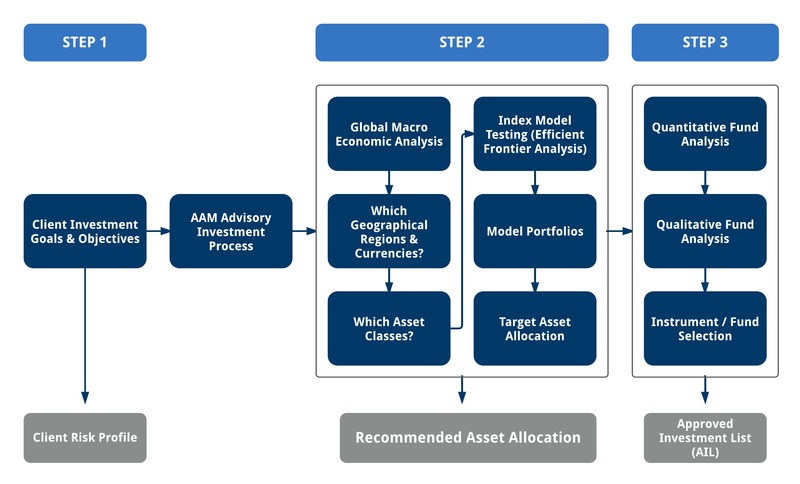 The overriding premise behind this approach is that asset allocation is of crucial importance if the investment objectives are to be achieved, and that these asset allocation decisions are determined by the current macro economic environment. The second tier fund selection process focuses on investing in the best performing qualified funds that meet the objectives of the asset allocation process. The initial investment strategy of your portfolio needs to be determined, as this will indicate some broad guidelines as to the asset classes to be invested in and their proportion within the overall portfolio. For example, if the investment strategy of the portfolio is income and capital growth, with tolerance to some fluctuations in both, then this would point towards a mix of defensive and growth assets in a balanced type of portfolio. While if the investment strategy is long term growth with a higher tolerance for fluctuations in returns (risk) then a higher proportion of growth assets will need to be included in the portfolio from the outset. When investing for the longer term, you can afford to involve a greater risk component on the expectation of achieving higher investment returns. You have time to “ride” the short-term fluctuations in value as you focus on the expected longer-term rate of return. On the other hand, if you are likely to need access to your investments, a low risk portfolio would reduce the likelihood of your investments having a relatively low value at the time of being liquidated. Before embarking on the investment process you need to decide how comfortable you are with investment risk and how much risk you are prepared to take to achieve the returns you want. This is often referred to as your ‘risk profile’. An asset class is really just a type of investment which forms part of the overall asset allocation. The main asset classes that people refer to are cash, fixed interest, property and shares. By investing in more than one asset class you can diversify your investments and reduce your risk. Once the overall investment objective & risk profile has been determined the approach used to determine the suggested asset allocation of a portfolio between the various asset classes is essentially a “top down” approach using “tactical asset allocation”. The global and individual country macro economic environment, (economic growth, money supply growth, inflation, unemployment, interest rates, current account etc), determines the relative attractiveness of the various asset classes at any particular time. This analysis of macro economic factors and the resulting asset allocation can be applied on a global basis. This would result in a portfolio allocation within each asset class but also within each economic region. It is important that this process of macro economic evaluation and asset allocation needs to be reviewed on a continual basis. The asset allocation within the overall portfolio may need to be adjusted as the macro economic environment changes, altering the relative attractiveness of the various asset classes. Investment selection is what follows once the overall asset allocation has been determined by tier 1 then individual assets or funds to be invested in within each asset class needs to be determined in tier 2. Initially the funds available need to be filtered according to their investment strategy and risk profile to ensure they match the desired profile from the asset allocation process. For example if an investment into an equity fund is proposed then only funds with that investment strategy and profile, should be analyzed. Once this initial “filter” of investment options has been made then each fund will be analyzed individually. This is done via a combination of qualitative and quantitative analysis. The qualitative analysis focuses on the credit rating of the fund management company, its size, length of time in operation, reporting disciplines, transparency, and licensing. These qualitative measures should ensure that only asset management groups of the highest quality are used, and thereby reduce the risk of default, fraud etc that would potentially have a very damaging impact on the overall portfolio. The quantitative analysis primary focuses on the performance of the fund, relative to its peers, and the appropriate benchmark. This analysis is in terms of returns but also in terms of volatility of those returns. The goal being to select the fund with the highest risk adjusted return. In closing, it’s important to understand that the recommended asset allocation is likely to change based on whether you choose to do a lump sum or a regular investment.